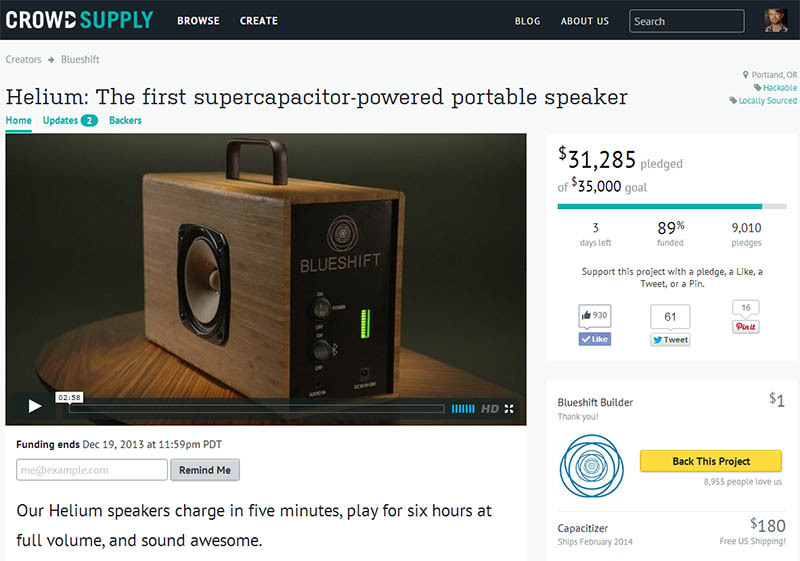 This is a guest post by Sam Beck, founder at Blueshift and creator of Helium, a super capacitor-powered speaker, as part of our ongoing coverage of crowdfunding in real-world situations. This is what happened during my first crowdfunding project, which is currently sitting at 97% of its goal with two days left on the clock. Our campaign’s goal was to cover the launch cost of our first product, a supercapacitor-powered portable speaker which would cost about $8,000 in compliance & overhead costs. The next time I do something like this, I’m going to make a giant poster of that baseline number – $8,000 or whatever it is – and hang it right in front of my face. The biggest mistake I made during this campaign was forgetting that number. Here’s how I messed up. About 90% of my planning was very realistic. I built a simple, conservative model, and set the variables so that if things went according to plan, we would make a bit of money on top of covering those costs. And then, I started imagining what it would be like to make two times the goal, or ten times. We almost failed because while there was a definite goal, I was thinking about a different number. That is my biggest takeaway from the whole project. There is only one goal; your objective is to meet it. Everything else is gravy. 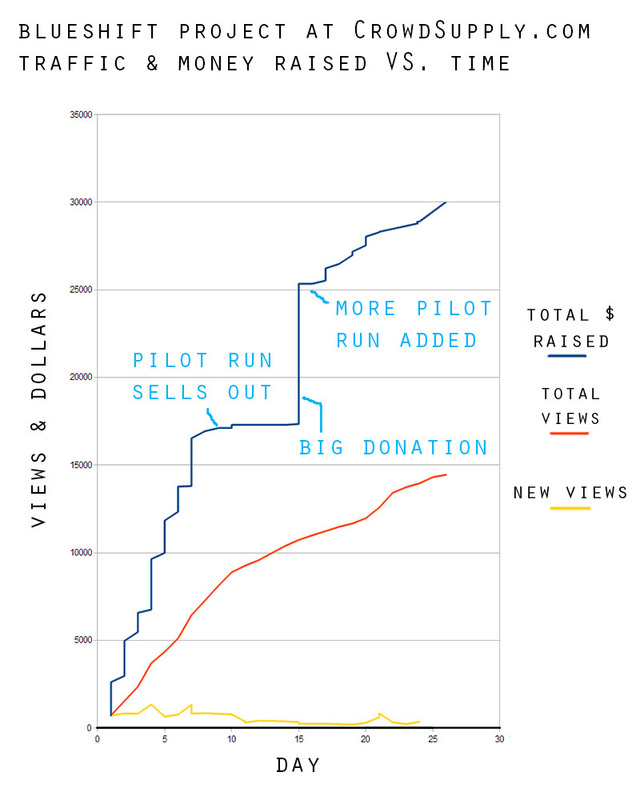 So that’s the first half of success in crowdfunding: know what success looks like. So this is how to plan once you know what you’re planning for. The first thing is to see what your market looks like. 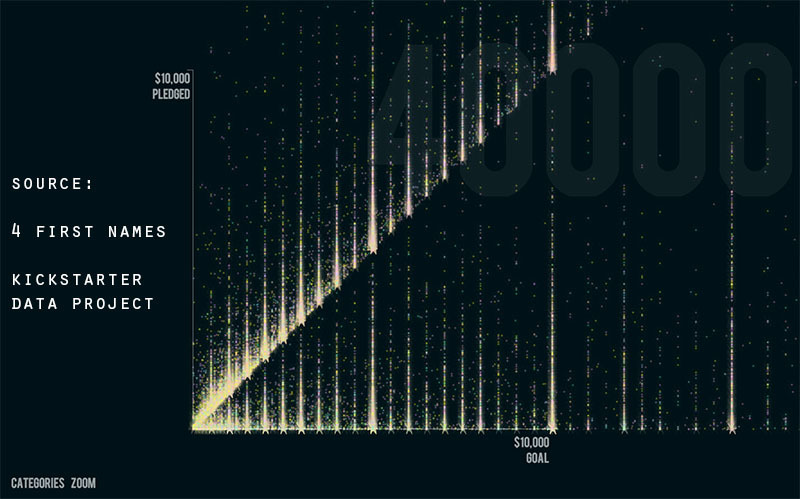 4 First Names has built an awesome set of open source tools to see the shape of your potential market – a very pretty Unity 3D visualization of the data from Kickstarter. They also scraped all the data from every Kickstarter project to make it work. Each dot is a project – the bright diagonal is the fact that projects that get close tend to meet their goal. The visualization is cool, but having the data from every project is awesome. For our working data set, we took the whole list and filtered it down to only Product Design and Technology projects that had raised over $2000, of which there were 2085. We were pretty sure we’d get over $2000 in pledges from friends and family on day one – if you can’t hit 5% of your goal within your private network, you are probably in a bad spot. Now, with this list of similar projects, we used simple statistics to think about our funding goal. 45% of these projects with goals $25-$35k were successful vs. only 35% of projects with goals $36k-50k. 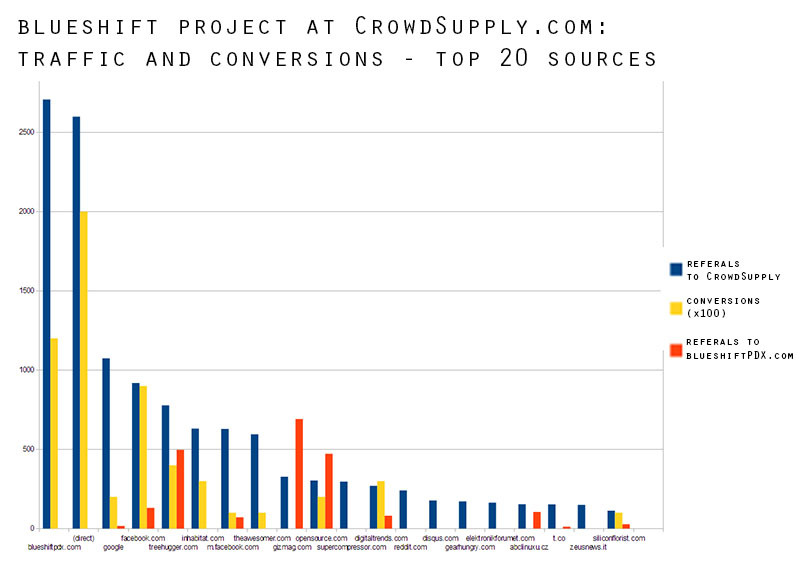 Getting even more specific, within audio projects, only 21% of projects aiming for over $30k have been successful. We settled on $30k as a goal, believing that our idea was in the top quartile of audio projects in terms of how much interest, media coverage, and organic traffic it would generate. With an idea of the goal in mind, it was time to set prices. We started out our price planning with a simple survey, run through Facebook & SurveyMonkey. It cost about $20 – but if I were going to do it again, I’d probably use SurveyMonkey’s paid audience feature instead of Facebook ads to (hopefully) get a better sample. Take the set of answers for each question, graph them in rank order, and you end up with a set of four curves that show how much people are or are not willing to pay. 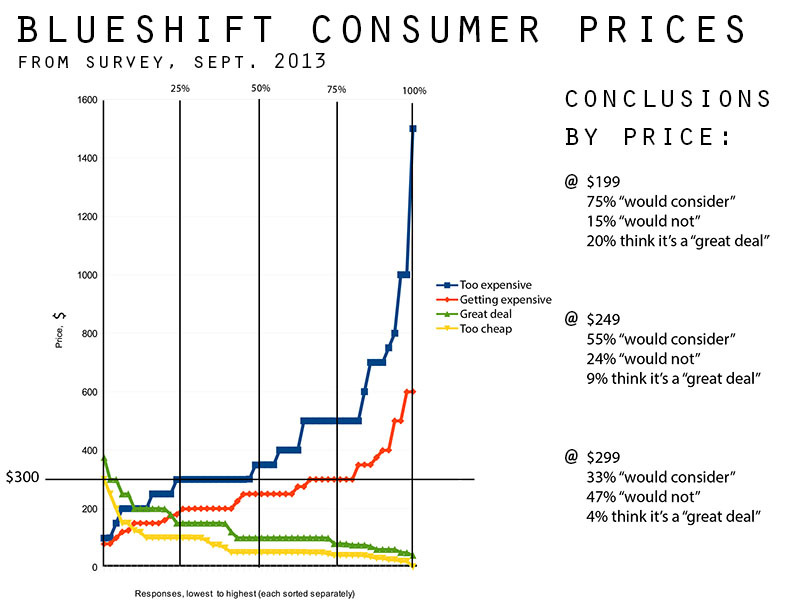 This helped to validate our initial guess that $300 was a pretty good price that many people would be willing to pay. It also showed how much demand would drop off as the price increased – in the neighborhood of 30% less demand for each $50 price increase. This survey gave us a slope for our demand curve, but no reference point. 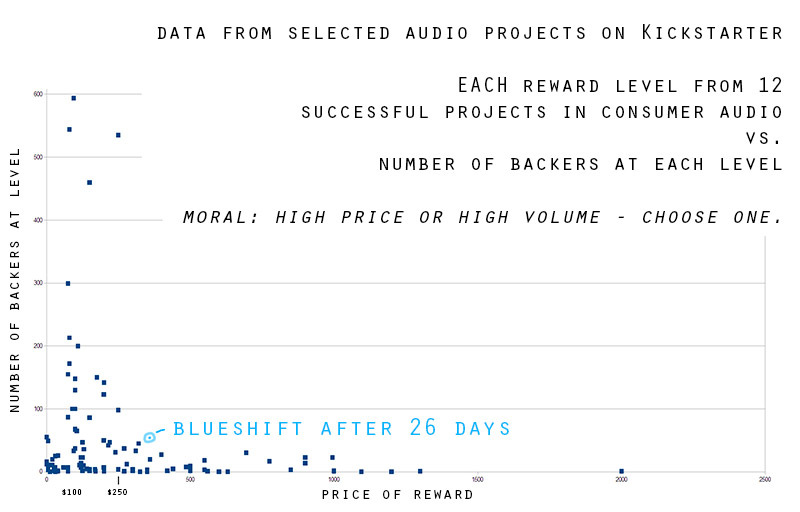 So we put together this chart: reward prices vs. number of backers from 12 related Kickstarter audio projects. It was enough to make an educated guess about how many units we might sell. This still left a continuous range of possible price and goal coordinates – the final decision was based on where I thought the product should be priced in the long term. Now we had informed guesses on a plausible funding goal, a plausible unit retail price, and how many units might sell at a given price. We knew our overhead costs and our per unit costs, including US shipping and 8% fees (3% credit card + 5% for the site). So we built a simple model and tweaked the pricing and goal until we would break even at the funding goal. This is where I made the big mistake. My idea on pricing was to have prices increase through the campaign. I remain convinced this is a good idea, but I messed up the implementation. The prices need to convince people they are getting a good deal, but they also need to present a sense of urgency. Initially the campaign was set up with 25 pledges at the first level (best price / earliest delivery). These sold out in six days, which was pretty good, about what I had hoped for. Then the price went up to the second tier (+$50), and the campaign came to a dead stop. The problem was that my carrot-stick pricing model was off. A $50 discount (carrot) was indeed a strong incentive to buy early, but conversely a strong disincentive to buy later. If demand had been high enough that the second tier (100 units) started selling out quickly, maybe it would have worked – but instead, it just sat there, telling people there was no need to buy today because there were 97 left. This probably would have killed the campaign completely, but we got a large cash donation on day 16, which allowed us to subsidize/add more pledges at the carrot level. Moral: if you’re going to do tiered pricing, make sure the tiers are small enough that they start filling in quickly! I thought that having a nominal ‘regular price’ as a stick would help to push the middle tier along, but the tier had too many slots for the stick to be credible. The last part, and probably the hardest part, is planning for traffic. I initially thought we needed to get 10,000 hits on the site to make the goal – turns out it was really more like 20,000. Our conversion rate at present is about 0.5%. Most of those conversions ultimately come from Facebook and direct traffic, but very few originated from Blueshift’s Facebook posts. It was serious a challenge to get enough media coverage. Doing this again, I would find a way to build demo units to send to the press – otherwise, you’re basically asking people to write about your press release (no matter how many times you reword the email). The only times that the campaign is “news” are the first day, the day you make your goal, and the last few days. Use those days wisely and reach out early. When you are not a news item, you need to find alternative means of generating traffic. We got a fair amount press, about 30 postings – but each bit of coverage brings only a small number of visits, and a smaller number of sales. I was surprised to see how few clicks some coverage generated: for example this article on Digital Trends got 650 likes on Facebook, but only 350 clicks to our CrowdSupply page. We were really lucky to get a big donation – if that had not happened, the project would have been effectively dead a few weeks ago. If I were going to do this again, I would have left out the international option, which would have saved us some money – we could have set a lower goal, and we have very few international pledges. Beyond that, making this work took me being a full-time marketer/internet fiend for about two months. Honestly, I just want to get the product built – but I don’t know of another way I could have gotten the money together, so we’ll call it a victory. Assuming it has gotten funded by the time you read this.